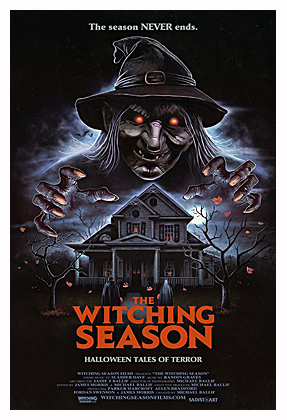 The Witching Season is an indie web anthology series, currently found on Amazon Streaming, created by Michael Ballif and is five stories filmed between 2015 and 2017. All the stories are set on Halloween and are filled with pumpkins, scarecrows and masked individuals to ad the nuance of horror’s favorite holiday. First story is written and directed by Baliff and is entitled Killer On The Loose and finds a pretty young woman (Hailey Nebeker) running for her life on Halloween night. She makes her way to an isolated home and with finding no one there, she enters and hides. Sure enough a masked man (James Morris) with a machete enters after her and now she is trapped alone inside with him. This was an effective tale and was atmospheric and suspenseful and even if we figured out where it was going to end, it was still creepy fun. Second story, Princess, is written and directed by James Morris from a short story by Baliff and finds pretty single mother, Kendra (Anita Rosenbaum) moving into a new house with her little girl, Jamie (Emily Broschinsky) at Halloween. Jaime finds a box of toys in the basement including a creepy stuffed rabbit she claims is called Princess. Soon strange things start happening and it’s almost as if Princess has a sinister life of it’s own. Another atmospheric and creepy tale even if we’ve seen the evil doll scenario dozens of times before. It still works. Third story is called Not Alone and is also written and directed by Morris. This story finds a man, Kyle (Sean Hunter) listening to UFO reports on a radio show and having some strange occurrences begin happening in his home. That’s about it. It is atmospheric, but doesn’t really go anywhere. It’s some weird things happening, a spooky climax and that’s it. Not Alone is the shortest and weakest of the five. Fourth story is called They Live Inside Us and is written and directed by Baliff and stars James Morris as a writer (and other various roles) who breaks into the Boothe House where a infamous murder/suicide occurred. He’s there to get inspiration for a horror script he is writing and let’s say he gets it in droves. An interesting and spooky story that is the longest and possibly best of the tales and is another atmospheric entry from series creator Baliff. It also stars Stevie Dunston as Mrs. Boothe who appears in all of the writer’s various scenarios. Fifth and final tale is called Is That You and is another directed by Morris from a story he co-wrote with Baliff. It’s a short and simple tale where a spooky nursery rhyme comes all too true for a girl, Whitney (Karlee Broschinsky) stuck home on Halloween night with an injured leg. There isn’t much to it and like Not Alone it’s basically someone in a house with weird occurrences going on around them until a spooky ending. It’s atmospheric, but again, like Not Alone, it really doesn’t go anywhere just sort plays out and then ends. I enjoyed this web anthology series which shows a lot of love for the spooky season and horror films from the series creative team of Michael Baliff and James Morris. Even the weakest of the tales had some Halloween spirit and all were atmospheric. Both directors got good work out of their cast of unknowns and seem to handle their multiple chores on each story quite well. Baliff seems like the stronger of the two behind the camera, though Morris shows potential even if all three of his stories followed the same format. He did create atmosphere. There is some great cinematography all around and some effective music on each story by Randin Graves and the series opening credits is quite effective at setting the spooky tone. A well done labor of Halloween love from creator Michael Baliff and collaborator James Morris. Can’t wait to see more from these guys!